Pam Cosper (pictured left), Perla Swindall (middle) and Courtenay Wannamaker (right) received 2014 Nurse of the Year Awards from the March of Dimes. Not pictured: Elizabeth Corwin. 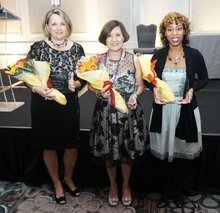 Four Emory nurses received top honors in selected categories at the 2014 Nurse of the Year Awards, sponsored by the Georgia Chapter of the March of Dimes. The nurses were recognized for their tireless efforts to provide exceptional patient care, compassion and service to patients in our community. This year, the March of Dimes reports that more than 800 nurses were nominated. From these nominations, 240 finalists were named and 16 nurses received top honors. "We are beyond proud of our Nurse of the Year Award winners and all Emory nurses who were nominated," says Susan Grant, MS, RN, FAAN, chief nurse executive for Emory Healthcare. "Every day, I am grateful for our amazing team of nurses – nurses known for their knowledge, skill, leadership and remarkable dedication." "Our awardees are most deserving of this prestigious honor by March of Dimes," says Linda A. McCauley, PhD, RN, FAAN, dean of Emory’s Nell Hodgson Woodruff School of Nursing. "They all possess a strong and abiding commitment to excellence in education, research and practice. We are truly proud as they continue to advance Emory’s national footprint in nursing leadership." The nursing profession has played a key role in the history and mission success of the March of Dimes dating back to its founding in 1938. Every year in the US, more than half a million babies are born too soon, 19,500 of them here in the state of Georgia. The March of Dimes works to improve the health of babies and support families in times of need.